The family with the 7 p.m. reservation at the restaurant Untitled in New York has never eaten there before, but the host recognizes them as soon as they walk in the door. They’ve been celebrating a birthday every year at Union Square Café, the flagship restaurant also owned by Union Square Hospitality Group, and the staff at Untitled noticed this when the family made its reservation through OpenTable. The staff also was aware that a family member had written a review on Yelp in the past praising the team at Union Square Café for remembering the birthday. Armed with that information at the pre-shift meeting, servers at Untitled greeted the family with birthday wishes — along with the sparkling water they prefer and a table not too close to the bar, which is also their preference. Variations of this hypothetical example are happening every day at restaurants that are leveraging digital tools to provide a higher level of service based on customer profiles. While restaurant personnel have long kept mental or written notes on the dining preferences of their best customers, they are now getting some help in the form digital systems that track visits and even suggest rewards to keep those diners coming back. “There are little touches that change the entire dining experience,” said Bryan Siegel, director of hospitality at New York-based LDV Hospitality, which operates a mix of high-end restaurants, cocktail lounges and cafés across the country. LDV is able to track customer visits throughout its different locations — including each customer’s history of food-and-drink orders — through SevenRooms, an all-in-one reservation, seating and guest management platform (left). Armed with information about its best customers’ preferences, individual LDV venues offer perks such as discounts or complementary dishes or drinks, based on the guest’s previous ordering history. “It makes it more like dining in someone’s home, rather than being a commercial experience,” said Siegel. LDV specifically sought out a platform that enabled it to keep tabs on its customers across the company’s different venues, said Ashley Noor, LDV’s vice president of marketing. “If someone goes to a property in Miami, then two weeks later goes to one of our properties in New York, we want to be able to track that visit,” she said. Although the technology exists for marrying information from social media with customer profiles, operators tend to limit how they use those insights because of privacy concerns, sources said. When a guest books a reservation using SevenRooms, they are given the option of using Facebook, LinkedIn or Google+. When they use one of those log ins, SevenRooms pulls any publicly available information, such as their name and photo, into the guest profile. Information from online restaurant reviews written by customers can also provide some insight for staff, if those accounts can be linked to the party making the reservation. Those connections are sometimes made through services such as Venga, which has the ability to combine publicly available information from social media sites with OpenTable reservations. Venga compiles such information into profiles that can be customized for both store-level staff and upper management. 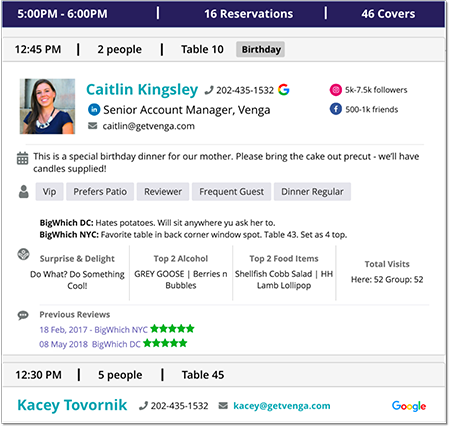 Venga generates pre-shift reports that can include information about the number social media followers a customer has, their most-frequently ordered food-and-drink items, number of visits and their history of providing online reviews for the restaurants in the group. It also suggests rewards for that customer based on reaching certain milestones, such as a fifth visit. 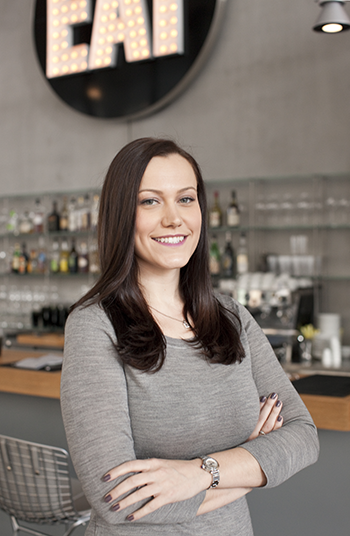 Gia SanAngelo, general manager at Untitled, said information about customers’ past visits can enhance the dining experience by facilitating even small gestures, such as offering a customer their favorite table, or setting out sparkling water before the customer asks for it. “Knowing what a customer likes or doesn’t like — it’s things like that that set us apart,” she said. The restaurant uses OpenTable to store information about guest visits, and adds notes about customer preferences and other personal details that staff might pick up during the course of service. This could include whether the customer is celebrating a milestone such as an anniversary or a birthday, the names of family members, and preferred seating locations. “In the same way your friends and family know what you like and don’t like, we want to be able to recreate that in the restaurant as well,” said SanAngelo (left). Information about customers is shared across all of the Union Square Hospitality Group restaurants that use OpenTable, she said. “We are a family of restaurants, so hopefully a guest would feel just as welcome if they came here, even if they had never been here before,” said SanAngelo. 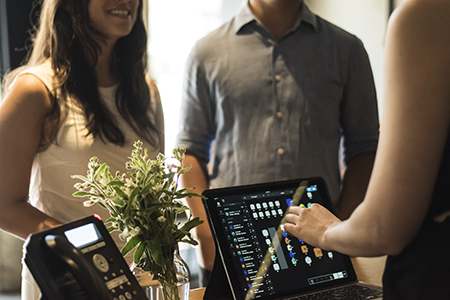 While technology helps restaurant companies keep track of their customers across time and location, in the end it is still a human touch that makes the difference in the customer experience, operators said. Restaurants need to cultivate a mindset around customer care that is shared among staff in order to make optimal use of the information, said Sean Sullivan, vice president of service for Atlanta-based Ford Fry Restaurant Group, which operates 15 locations in three markets. Ford Fry Restaurant Group uses Venga (left) to maintain its customer database, which works in conjunction with OpenTable to track customer visits and connect reservations with specific customer profiles. Staff at individual restaurants need to be empowered to make decisions about rewarding their customers based on that data, said Sullivan. Knowing that a regular customer usually orders a certain type of wine might prompt a server to suggest a tasting flight of other similar wines, for example. “You have to get the whole team involved,” Sullivan said, noting that back-of-the-house staff also sometimes come up with creative rewards for customers too. In one case, a chef once gave a bottle of specialty olive oil to a regular customer, for example. By hiring the right people and equipping them with the right tools, operators can create opportunities to “surprise and delight” customers, he said. SanAngelo of Untitled said Union Square Hospitality Group also gives its staff a lot of leeway when it comes to rewarding the most loyal diners. “The management team is always ready to weigh in as far as what’s appropriate, but we really try to empower our teams to determine what would be special for our guests,” she said. To recognize a birthday, for example, some guests might enjoy a cake with a candle, and others might simply prefer to be wished a happy birthday verbally. In some cases, Untitled has given customers a birthday card signed by the restaurant staff.